Levain Bakery in New York City makes a serious oatmeal cookie. 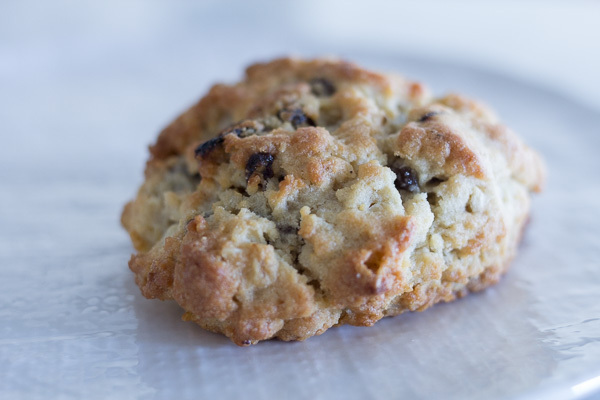 Thick and chewy,filled with raisins and big enough to be a meal replacement, ABK’s Levain Bakery Oatmeal Raisin Cookie is a cookie your granny will love! Last year, when I visited New York City and tasted my first Levain Cookie, I knew I had to make a copycat cookie so we could enjoy the Levain goodness anytime a craving struck! It began with the Levain Bakery Chocolate Chip Walnut Cookie, then the Levain Bakery Dark Chocolate Peanut Butter Chip Cookie, and now, my latest Levain copycat recipe, the oatmeal raisin dream. If you read my original post, you know about the cookie heist story involving my friend Maria and her husband Dave and one highly suspect man carrying her Levain bag off of the plane! Each time I’ve worked on a copycat, I’ve had a cookie carrier bring me cookies so I can taste, test and try to duplicate with authenticity. Of course, there are no ulterior motives… I don’t WANT to eat all of these cookies, but for the sake of science, I feel it’s my duty. For the Levain Dark Chocolate Peanut Butter Cookie, my friend Kristin brought back a sample. For the Levain Bakery Oatmeal Raisin Cookie, my girlfriend Melinda carried the cookie back so I could taste test again. It had practically been a year since my last tasting of the oatmeal cookie and I wanted to get it right! It has to look like the original, right? This copycat version looks a lot like the store bought. It’s big- 6 oz worth of cookie. You get about 9 cookies per recipe which (at the bakery) will cost you about $36 plus tax. If you live in NYC or are visiting that’s a great option. The cookies are huge. They’ll fill you up in a heartbeat. Or is that a heart attack? Either way. They are filling! This at home version looks just like the store bought original. I like a cookie that has a good balance between salty and sweet. In my opinion, the Levain cookie is a little lacking in the balance category. It’s really sweet and needs a little more salt. That said, this is a copycat of the Levain Bakery Oatmeal Raisin Cookie, and I wanted to create something that looks and tastes like the version you get in the store. The recipe I developed calls for 1/2 teaspoon of salt, but I usually throw in a full teaspoon because I like a little more salt in my cookie. I always use unsalted butter as well, so I can control the amount of salt going into my baked goods! The Levain owners have stated they like to keep things simple in their recipes, so I followed their lead in the Levain Bakery Chocolate Chip Walnut Cookie – no vanilla. They state on record that “vanilla doesn’t add much flavor”, so they left it out of the recipe. Also, I love walnuts with oatmeal raisin cookies, but the Levain Oatmeal Raisin Cookie does not include walnuts, so I left them out of my recipe. 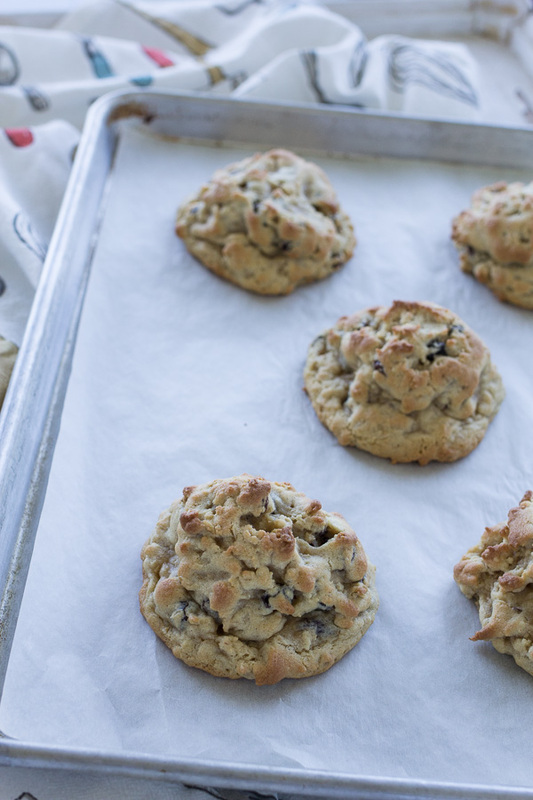 All the tips for the best Oatmeal Raisin Levain Cookie copycats! Turn up the heat-The high heat is what cooks the outside of the cookie to a nice golden brown color, and barely cooks the inside of the cookie. If you have convection USE IT. If not, the cookies bake up perfectly without convection. The batch in all of the photos on this post were made using the regular bake feature on my oven. 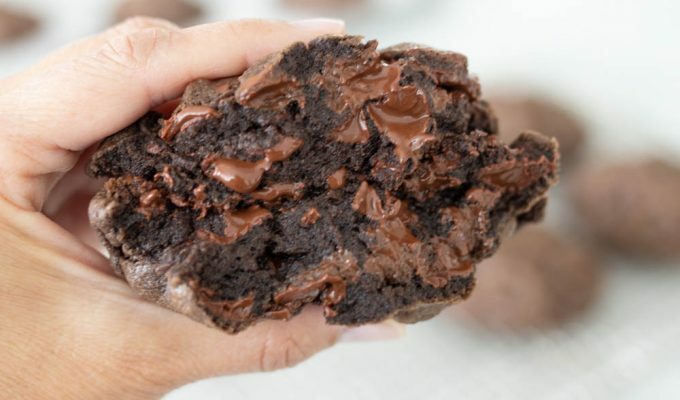 Don’t overmix- #1 tip always for making yummy cookies or brownies! Over mixing the dough will cause your cookies to become tough. Less is more in the mixing department! Keep the mixer on low or medium low at all times. I like to use the pulse action to get the ingredients incorporated without over mixing. Weigh it out and stack it high- If you want your cookies to turn out like the cookies pictured, weigh the dough, 6 0z each cookie, and stack the dough high. Don’t flatten the dough at all, just pile it on the cookie sheet. It will spread a little. If the dough spreads too much, use a little spatula to push the edges in right after it comes out of the oven. You may also make mini versions of the Levain cookies, for each mini, weigh dough to 3 oz each and bake for about 4-5 minutes. Let it cool- On the previous posts, I once in a while receive comments saying the cookie “fell apart” after baking. This is the result of not letting the cookie cool properly. This cookie is thick and weighs almost 1/2 lb. It is barely baked, so it needs to be allowed proper cooling time before the cookie is moved off of the baking sheet. I like to let the cookies sit for at least 30 minutes or more. 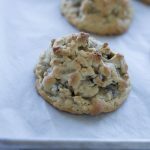 The Levain Bakery Oatmeal Raisin Cookie is perfect for make ahead, as well as enjoying on the day of baking. Wrapped, the cookie can stay fresh for several days. They also freeze well stored in a Ziplock bag. Hope you love this recipe as much as we do. Happy baking my friends! Pre-heat oven to 425 degrees or 400 convection with rack in center of oven. In the bowl of a stand mixer, or a large mixing bowl, place cut butter. Mix on low until butter is broken up. With the mixer on low, add sugars. Blend until there are no visible chunks of butter, about 1 minute on low or medium low. Add eggs and mix until smooth on low or medium low. Stop mixer and add flour, cornstarch, oats, baking soda, salt and cinnamon. Pulse the mixer until the wet and dry ingredients are incorporated. This will take about 10 pulses of the mixer (quick on -off motion) . Then mix on low until the flour disappears. Mix the raisins in using the pulse motion again. 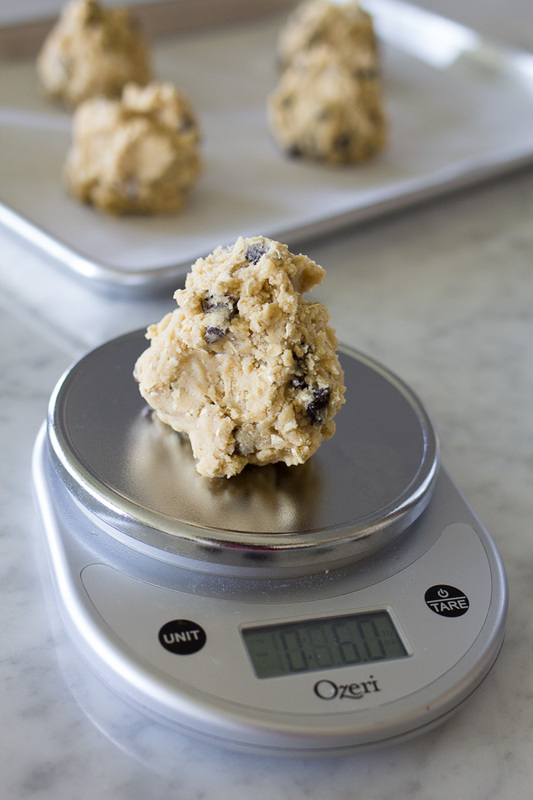 Using a kitchen scale, measure out 6 oz portions, do not compact the dough or use a cookie scoop, the cookie is meant to have a rough shape! Stack the cookie high so it will still be thick after baking. Place the cookies on a cookie sheet or jelly roll pan 4-5 per sheet. Bake for 6-7 minutes or until the cookie is barely set and golden on top. Remove from oven and let sit for at least 30-60 minutes to allow the cookie to set up. -The butter should be barely soft.I can see an indentation when I push my finger into the side of the butter, but the butter will not totally collapse. Either leave the butter on the kitchen counter for about 30 minutes before using or microwave the butter. I remove my butter straight from the refrigerator and microwave it for 18-20 seconds, My microwave is not very powerful, most microwaves will probably need about 10-12 seconds to achieve the right result! -The size of the eggs will determine the amount of moisture in the cookie to some degree. I recommend using large or extra large eggs. The extra large eggs from Costco are HUGE, so you may need to add a bit of flour 1-2 tablespoons if the dough is wet and sticky after mixing all ingredients together. Fold in the extra flour with a large spoon or spatula. -sea salt is recommended but not absolutely necessary. I like the flavor of sea salt as opposed to table salt. The next time you have both sided by side, pour a little in your hand and taste the difference! -You may substitute 2 cups of chocolate chips ( I recommend dark of semi sweet chocolate) for the raisins. For me this is something unique way to use oatmeal in my diet. Made these exactly to specifications (using 1 teaspoon of salt) and they were AH-MAZ-ING! I have made Si’s tried and true chocolate chip cookies (a favorite) and also the copycat Levian Chocolate Chip Walnut. I have to say I think I like these more than both of those! My 7 year old declared these “the best cookies I have ever made”! If anyone have people in their house that doesn’t like raisins. I weighed the dough and split it in half. I mixed Raisins in half the dough, and chocolate chips in the other half. Worked perfectly! I have not tried using chocolate chips (yet!) but have had lots of questions so it’s good to hear how you made this batch with half raisins and half chocolate chips! And a 7 year old’s endorsement is the best kind! These are LEGIT. I used choc chips instead of the raisins and they’re soooo good! This and your regular levain chocolate chip cookies have become the end of all cookie searching. I’m a serious cookie connoisseur and I’ve been searching for “the one”. I guess I’ve found “the two”! Thank you!!! Thanks Holly! Everyone loves the Levain copycat recipes! Thanks for following ABK. 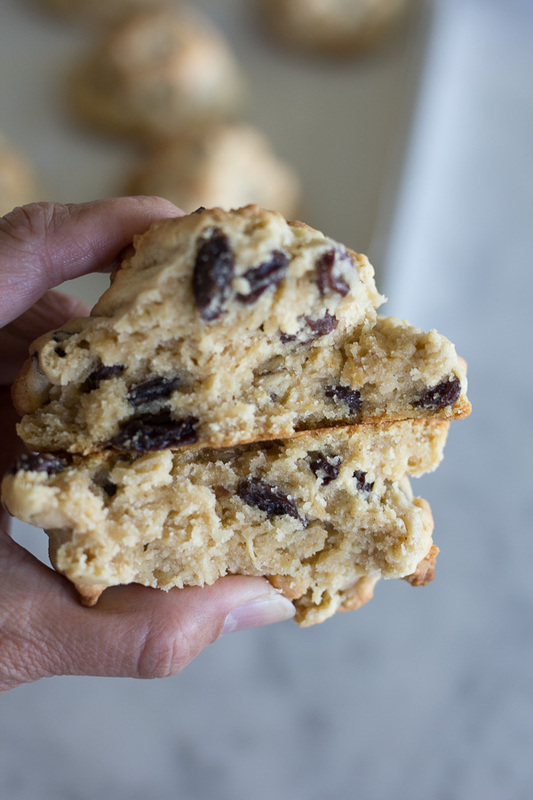 I replaced raisins with chocolate chips and they were amazing! Same ratio. xo thanks for these amazing Levain recipes!!!! Thank you Emi! Thanks for your note about modification too! Ok these were the bomb!!! Seriously so good!!! I made 4 oz size cookies so they would go farther and baked them for 5 minutes at 400 convection. I will definitely be making them again!! Thanks for the recipe! Can I add walnuts? In addition to the raisins? I use butter that is slightly softened. I take it out of the fridge and microwave it for about 18 seconds in my microwave, but for most people about 10-12 will do. My microwave is not especially powerful! You can also just set the butter on the counter for about 30 minutes before using. Should the brown sugar be packed or loosely measured? Is the brown sugar packed or measured loosely? I lightly pack the brown sugar. I hope you enjoy making and eating these cookies! Send me a picture on Instagram and I’d be happy to share it. Any tips for baking the dough after it has been in the fridge? I usually take the dough out for about 15 minutes while the oven is heating up and then bake as directed, it may take a minute or two longer for baking after refrigerated! Hi I just returned from NYC carrying 1.5 doz Levain Oatmeal Raisin Cookies home on the plane. When I got back I looked for a clone recipe and found yours. I made them this morning exactly as directed but they came out really anemic looking. Not nicely browned on top like Levain’s and your pictures. I have an oven thermometer and all is good with the oven. Plus they looked raw. How did you get them so nicely brown on top? All ovens cook differently. As you bake your cookies, make sure the top doesn’t look shiny, and starts to brown. Pull them out and let them sit for 10-15 minutes until they set. What type of oven are you using? I use a convection oven. Gas ovens tend to take longer. Hope your second try works a bit better. You’re welcome, Karen. Thanks for sharing and for reading ABK! Hi Linda, if you’re not using parchment paper, I would grease the cookie sheets. Thanks for asking and for reading ABK! Hi Linda, the cornstarch is listed in the ingredients list for 1/4 cup. Hi! Has anyone made these without the corn starch with success!? I have someone in the fam allergic to corn. Really great recipe! Super easy and straight forward. they look exactly like levain cookies and taste super super similar too. I highly recommend trying them out. Thanks for the recipe! Thanks for your comment, Clare. I love how easy and delicious they are too, and how much they taste like the original version. These cookies are perfect in every way. Amazing what a small amount of cinnamon does to that amount of dough. Thank you for all the testing you did to give us a free recipe that my family will enjoy for years to come! You’re very welcome, Elizabeth. 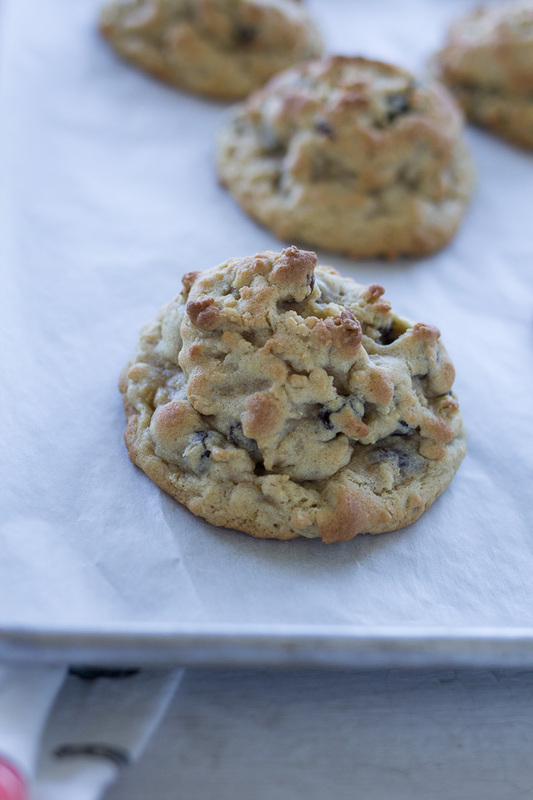 The Levain Bakery cookies are some of my favorites to make because of their delicious flavor. Thanks for sharing and for reading ABK! What modification would you recommend for a mini (3 oz) cookie? I tried them and they were great, except they didn’t spread out much. When I made your Levain Chocolate Chip Walnut cookies in the mini size, they were perfectly spread out yet thick and soft. Any suggestions?